Since 2011, Republicans nationwide have demonstrated their devotion to dismantling women’s reproductive rights. In 2011, 92 laws were passed in states around the nation restricting abortion and, in 2012, 43 anti-abortion bills were signed into law. Thus far, 2013 has seen a continuation of this unrelenting assault on women’s rights. It has been a particularly challenging year for women in the South, who saw Alabama’s TRAP Bill, HB 57, signed into law in April, requiring abortion providers to have admitting privileges in a local hospital; also, we almost saw Mississippi’s sole abortion clinic shut down due to similar anti-abortion legislation passed in 2012. Most recently, North Carolina and Texas have attempted to push through some of the most restrictive anti-abortion laws in the nation. Last month, Democratic State Senator Wendy Davis received widespread publicity after successfully staging a filibuster to prevent Texas’ extraordinarily restrictive anti-abortion bill from passing in the Senate. Unfortunately, her efforts proved to be in vain when Texas Governor Rick Perry called a second special session one week later, and the Texas GOP took preemptive measures to silence protesters. The bill, which will likely be signed into law by Rick Perry, threatens to shut down all but six abortion providers in the state by mandating that abortion clinics meet the outpatient surgical center requirements. It would also ban most abortions after 20 weeks of pregnancy and limit medical abortions (abortions induced by medication). 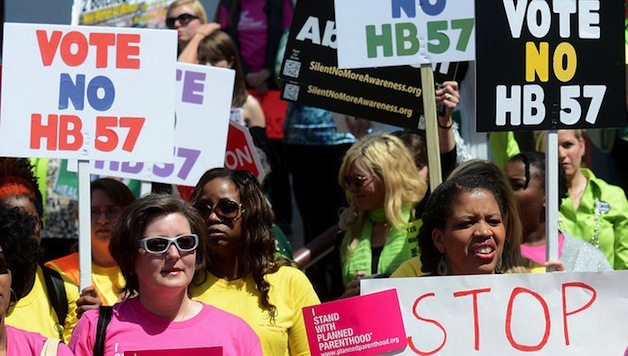 In the last week, the Republican-led North Carolina House of Representatives pushed through anti-abortion legislation by tacking it onto the end of a motorcycle safety bill drafted by the state Senate. The legislation added to the bill would make it mandatory that women undergoing a medical abortion take the first dose of medication in the presence of a doctor. In addition, public employees would no longer have access to insurance plans that include abortion coverage. The additional unnecessary restrictions on abortion are bad enough, but the tactics employed by Republican leaders to pass the legislation are particularly shameful. When Republicans reintroduced the bill with additional legislation to the House Judiciary Committee, they did so without notifying the public or Democratic members of the House, thus sharply limiting debate and the ability for any organized resistance. The bill has since returned to the Senate for approval. This bill, which has a title that now contains 123 words pertaining to abortion and a mere 17 words about motorcycle safety, demonstrates the devious strategies that Republicans are willing to use to avoid opposition to their anti-woman agenda. The recent attacks on women’s reproductive rights, which are deplorable in and of themselves, are part of a broader trend that threatens not only women’s rights, but also the rights of all working people. In North Carolina alone, the Republican-dominated General Assembly has put forward legislation ranging from fringe-reaching suggestions to adopt a statewide religion to the slashing of unemployment benefits, rejection of federal funds to help expand Medicaid to uninsured North Carolinians, and instituting racist voter ID laws, among other things. Texas has long been home to anti-worker legislation, being the first state to institute “right-to-work” laws. Using conservative legislation as its propeller, the South is leading the nation in its race to the bottom. Both of these anti-abortion bills, if signed into law, are likely to be challenged in federal court, but it’s unlikely that this will slow the ever-increasing attempts on the right to outlaw abortion without blatantly moving to overturn Roe v. Wade. The efforts of Democratic state leaders, while well-meaning and even commendable at times, have proven to be ineffective, continuing to demonstrate the inability of the Democrats to effectively fight back against the right-wing attacks on women, immigrants, people of color, and workers. The struggle in Wisconsin in 2011, in which thousands of workers occupied the state Capitol to protest anti-union legislation, particularly highlights the dangers of putting such a movement in the hands of the Democrats. The failure of the leadership of this movement to make clear, bold demands, particularly to call for a one-day public sector general strike, resulted in the Democrats seizing the opportunity to focus on a recall of Scott Walker, with the primary motive of electing a Democrat in his place – a tactic which failed miserably. Movements like the “Moral Monday” movement cannot afford to put their faith in the Democrats, who have – time and time again – demonstrated that they are ultimately aligned with the 1% and are not willing to take the necessary steps to protect the people from right-wing repression. In order for women, workers, and youth to mount a successful resistance to the growing reactionary, right-wing agenda, we will need to do so without relying on the Democrats. We need to be prepared to organize mass rallies and protests, even occupying state capitols if necessary, to express our dissent and make our demands. We also need to organize a third party as an alternative to the two parties of Wall Street and to mount a true legislative offensive against reactionary, anti-woman, anti-worker legislation. We need to demand not only the preservation of Roe v. Wade, but an expansion of women’s reproductive health care, including free, accessible abortions. In addition, we need to demand adequately compensated maternity and paternity leave, as well as free, quality child care for working men and women who choose to have children. And we need to fight for these children to grow up in a world where they have access to quality, affordable health care, food, shelter, and clothing, as well as access to living-wage jobs. If working people, women, and youth unite and organize against the right-wing agenda in the South – and all around the nation – we can win a better world for working men and women everywhere.